how air monitoring equipment is helpful? Air quality is something that is important to everyone, including individuals, business owners, and workers. Air quality refers to the condition of the air that surrounds us, both indoors and outdoors. Whereas good quality air is essential for enjoying healthy life and well-being, poor quality air endangers humans, vegetation, wildlife, water, and soil. There are a number of factors that affect the quality of air. Pollutants and emissions from cars, trucks, factories, chimneys, air conditioning units, and heating units are some of the sources that make the air quality poor. 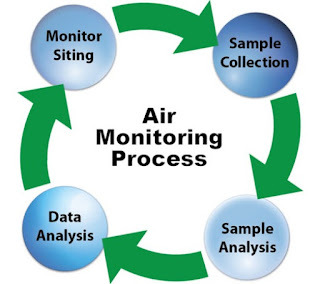 Air can be monitored in several ways. The presence of contaminants in the air, such as carbon monoxide, nitrogen dioxide, sulphur dioxide, hydrogen sulphide, ozone, and particulate matter can be measured either through real-time or discreet monitoring. In real-time or continuous monitoring air is constantly measured and the data is automatically transmitted to a central database. In case of discreet or non-continuous monitoring, contaminants collect on a filter over a specified period of time. A technician then collects that filter and sends it to a certified laboratory for measurement and analysis purpose. Air monitoring equipment is quite helpful in air monitoring. There are several kinds of air monitoring equipment available to meet varied air monitoring needs and equipment. Diffusion detector tubes are one of the simplest, and also the most commonly used air monitoring equipment. This air monitoring equipment consists of a glass tube with a chemical reagent impregnated in a silica layer. One end is broken off and the tube is placed in a tube holder. To calculate an accurate level of impurities in the air, the sampling start time must be recorded on the writing area of the tube. The indicating area has a calibrated scale where the reaction with the sample gas or vapor takes place. The tube is read by looking at the discoloration and recording the parts per million (ppm) value from the scale. The time-weighted average is obtained by dividing the scale value by the total amount of time sampled in hours. Diffusion-detector tubes meet OSHA-Occupational Safety and Health Administration- guidelines for air sampling, but they are not the most accurate method of air sampling. The device gives immediate reading and eliminates the need for waiting for the lab results. Detector tube and pump systems are other air monitoring equipment that are very effective in carrying on-the-spot air monitoring. There are two kinds of detectors-piston and elbow. In case of piston style, the user has to pull a piston to pull air through the tube. With the bellows style, the user squeezes the bellow, and upon release, air is pulled through the tube as the bellow opens. For getting measurement, several types of tubes are used such as scale tube, qualitative tube, pre tube, color matching tube, and color comparison tube. Detector tube and pump systems are affordable and allow quick sampling and air monitoring. Some other types of air monitoring equipment include fixed air monitors, hand-held monitors, vapour monitoring badges, and personal air sampling pumps. For choosing the right air monitoring equipment, know what type of hazards you may encounter, which gases you need to monitor, your budget, and how fast you want the air monitoring results. Scientific World: What is air monitoring?